Famous volleyball players Karch Kiraly, Misty May Treanor, Kerri Walsh, Logan Tom, and more. 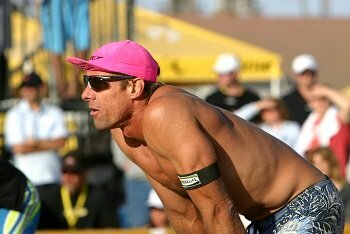 Wearing his hot pink hat, Karch Kiraly was an easily recognizable figure during his days playing volleyball on the beach. Karch Kiraly has the most professional career beach volleyball tournament victories (148). Karch Kiraly is the only volleyball player to win three gold medals (1984, 1988, 1996). Karch Kiraly is known as the sparkplug that inspired the 1984 and 1988 USA Mens Olympic Volleyball Teams by playing outstanding volleyball and encouraging his teammates to play their best. Logan Tom is a phenomenal athlete and one of the most dynamic volleyball players in the world. Logan Tom's impressive talent has made her one of the most famous volleyball players in the world today. At 6 feet 1 inch tall, Logan Tom plays volleyball with strength, power, and grace. Logan Tom was a four-time first-team All-American at Stanford. Logan Tom was a two-time NCAA National Player of the Year. Tom was MVP of the NCAA Final Four in 2001. In the Sydney 2000 Olympics, at 19, Logan Tom was the youngest player on the National Team, yet she started for the team and placed fourth. Logan Tom is an international superstar that has played professionally in Brazil, Italy and Switzerland. Misty May-Treanor is arguably the best all-around skilled womens beach volleyball player ever to play the sport. Misty May was voted the AVP Most Valuable Player in 2005, 2006, and 2007. Misty May is currently the winningest Female Beach Volleyball Player of all time. Misty May holds the world record for most consecutive beach tournament victories (15). Misty May holds the world record for consecutive match victories (90). Misty May Treanor is one of only three players to be named a two-time AVCA National Player of the Year. Kerri Walsh currently partners with Misty May Treanor as the best women's beach volleyball team in the world and likely the two most famous volleyball players. Kerri and Misty had an astonishing win streak of 38 matches in their first year on the AVP Tour. Kerri and Misty had an unbelievable 89 match win streak on the AVP Tour and the international circuit between 2003 and 2004. Kerri Walsh is a two-time AVP MVP (2003, 2004). Kerri Walsh has lead the AVP in both blocks and hitting percentage the last two AVP seasons. In the 80's, Steve Timmons wore a wild red flat top that made him the most identifiable indoor volleyball player in the world. Considered a pioneer of back row hitting, Steve Timmons combined with his outstanding front row attacking skills made him an unstoppable force. In 1984, Steve Timmons was named MVP of the Olympics by the FIVB after leading USA to a Gold medal. Paula Weishoff is one of only 4 USA women's volleyball players to compete in 3 different Olympics. Throughout her career, Paula Weishoff was a dominating blocker and server. Paula is the only American volleyball player to have played in Olympic Games 12 years apart (silver in 84, bronze in 92). Paula Weishoff won an Outstanding Player award for her performance at the 1992 Olympics. Ron Von Hagen is considered the Babe Ruth of beach volleyball. Ron Von Hagen established standards and set records at a time when beach volleyball was just beginning. Ron Von Hagen played in 54 tournaments from 1966 to 1972 never finishing lower than third place. Flo Hyman was one of the greatest and most famous volleyball players of her generation. She was named All World and selected as the Most Valuable Player in countless international tournaments, as well as being named to numerous All-Star Teams. In 1985 she was named one of the All-Time Great Volleyball Players. Flo Hyman was voted Best Attacker at the Pan-Am Games in 1975, 1979, and 1983, the NORCECA Championships in 1975, 1977, 1979, 1981 and 1983, and the World University Games in 1973 and 1977. Misty May-Treanor is one of the most famous womens beach volleyball players in the world. Ranked #1 in the world, with doubles partner Kerri Walsh, Misty..
Flo Hyman is one of the greatest volleyball players in USA history. Voted one of top 6 players at the 1981 Worldcup and #69 on greatest century woman athletes.